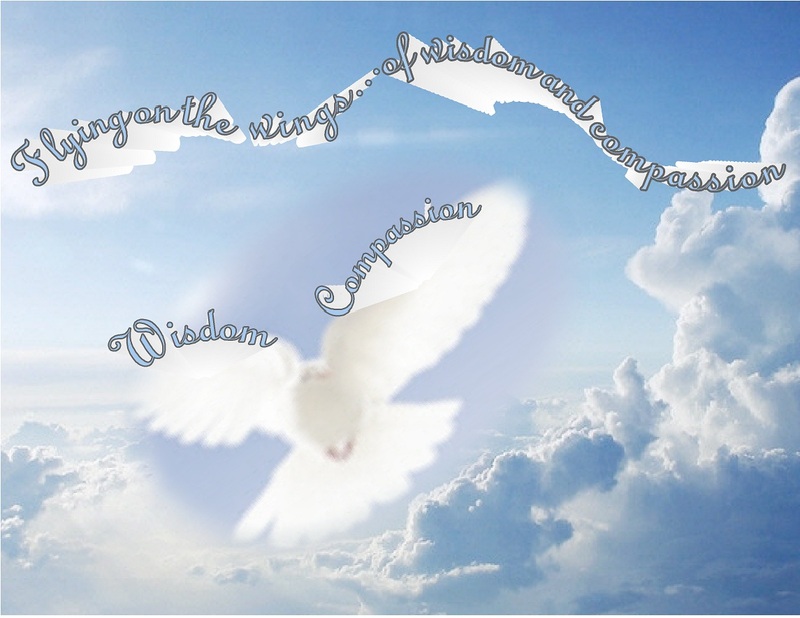 Flying on the wings of wisdom and compassion…. A bird needs two wings to fly. One wing can be represented by “wisdom”… the perspectives and deep insights about the nature of life, the universe, people and their interactions. The other wing can be represented by “compassion”… a sense of connection, love, kindness, acceptance and the heartfelt wish for all others to be free from unhappiness or suffering. This entry was posted in Compassion and tagged Compassion, Inspiration, Life, Spirituality, Wisdom. Bookmark the permalink. 29 Responses to Flying on the wings of wisdom and compassion…. The image of the 2 wings of the bird is from the teachings of Buddhism, but the idea is included in many traditions… I think the bird is a lovely mental image to keep in mind when balancing the 2 aspects. Kathy, Beautiful! I will now be reminded everytime I see a bird fly of one wing having wisdom and the other having compassion for perfect balance. I try to keep that in mind too….and I find the image of the bird to be a helpful example. I had not previously thought of balancing wisdom and compassion like the two wings of a bird. Thank you for this image; it truly helps to implant this concept in the mind’s eye. The idea of the 2 wings of wisdom and compassion is important in many spiritual or philosophical traditions, including Buddhism. I like the concept very much! Kathy, I am not even going to try to catch up from the holiday madness. I’ve dropped back on my publishing to concentrate on my book, so hopefully that allows more time for READING!!!! What a busy holiday time you’ve had…I’ve thoroughly enjoyed following your family’s adventures in your blog….but goodness…..veryyyy busy!…be sure to get moments to rest, too, okay? and the tail feathers are knowledge? (grin) just playing with this … love it! Happy New Year Kathy! Wisdom and compassion, a perfect pair of winged messengers sent to balance the world. Lovely! Oh, Leah…you have such a wonderful way with words…that is beautifully phrased… “Wisdom and compassion, a perfect pair of winged messengers sent to balance the world.” ….that is absolutely beautiful! two wings >>> lovely – thx for the inspiration . I think you have the seed of a story here. Wonderful image! Thank you. You’re welcome….I love the idea of the 2 wings to fly…it’s a very important part of many spiritual traditions, Buddhism included. I printed out that image onto small cards and carried one in my pocket yesterday…it would be remarkable to be able to live with those 2 qualities. HI Jackie, welcome…it’s so nice that you found us here… I love imagining being a bird and flying…such an amazing sense…and catching those upward drafts…kind of like being around positive people, I think…and then to fly on the wings of wisdom and compassion…ahh..special….